The SADC Ministers Solidarity Conference with Western Sahara will serve to remind the region that Africa will not be truly free until the last colony, the Saharawi Arab Democratic Republic, is decolonised, says International Relations and Cooperation Minister Lindiwe Sisulu. Sisulu made the remarks while welcoming guests on the first day of the two-day conference in Pretoria on Monday. The preparatory meeting by the Southern African Development Community (SADC) Ministers and participating Ministers from other regions took place ahead of the SADC Solidarity Conference with Western Sahara by Heads of State and Government scheduled for today. 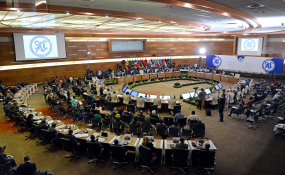 The SADC Solidarity Conference with Western Sahara, said DIRCO, is convened to, among other things, reaffirm the right of the people of Western Sahara to self-determination in line with the principles of the Charter of the United Nations (UN) and applicable documents of the Organisation of African Unity (OAU) and African Union (AU). "This conference is a clear demonstration of our international solidarity with the Saharawi people in their quest for self-determination. Over the next two days, SADC hopes to come up with concrete steps in which we can strengthen and support the right of the Saharawi people to self-determination. It is this kind of solidarity and support for the people of Western Sahara that must give courage and impetus to their struggle for self-determination. "Most of us here have attained our freedom, strengthened and assisted by the solidarity of people who cared about our plight. We knew that every country has an inalienable right to independence and self-determination," said Sisulu. The Minister acknowledged the significant role played by the United Nations through the passing of resolutions aimed at raising the plight of the people of Saharawi, including a decision that there must be a referendum in Western Sahara. "We as South Africans are honoured to host this conference as South Africa is itself a product of international solidarity. Let the people of Western Sahara leave this conference with the knowledge that we are fully behind them," she said.